Friends, today is the easy and tasty recipe day. Our friend Iratxe knows that we are hopeless in the kitchen and has sent in a recipe that even the most incompetent person can prepare. Thanks for thinking about us, dear! The thing is, as well as being a very simple pintxo, it’s a delicacy fit for gods. Let’s get down to business. Toast the bread in a frying pan with some butter. Remove the flesh from the avocado and mash it to spread it on the bread. Chop some lettuce leaves and the tomato. Spread the avocado and add the lettuce and tomato on top. 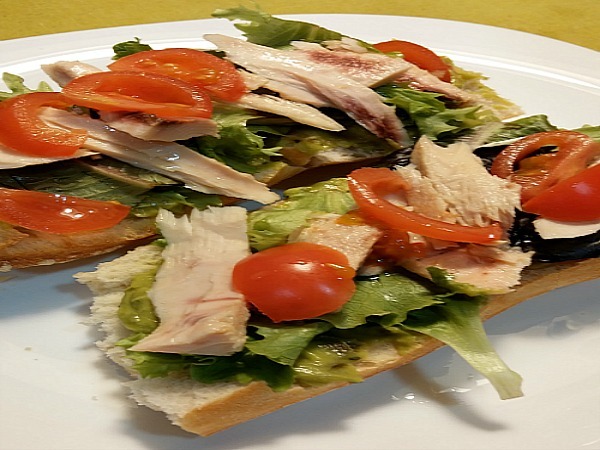 Last of all, add the Serrats albacore tuna neck in flakes and a dash of extra-virgin olive oil. And there you go! You now have a snack to enjoy with your friends. Come on, give it a try because it will be a hit among your guests. Tell us how it went. A quick and delicious snack, thanks Iratxe!